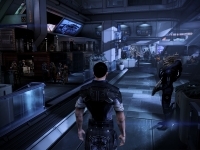 Five years prior, Mass Effect was BioWare’s new, unproven IP, and exclusive to the 360. Now it’s a critically acclaimed, multiplatform epic that’s broken records all the way to its third and presumably final chapter. Expectations couldn’t be higher, and no doubt BioWare could empathize in feeling the weight of a galaxy on their shoulders. Although noticeably flawed, for the most part Mass Effect 3 is every bit the emotional, action-packed, and deeply personal adventure it was advertised to be, and it’s not fair to claim that a highly criticized ending undermines the whole experience. Yet here I am, about to say exactly that: Mass Effect 3 fumbles the end so spectacularly that, rather than feeling satisfied or eager to revisit the saga, I’m just ready to put the whole sad mess behind me. Little time is wasted in setting the stage. Shepard is back in the Alliance, warning in vain of the coming Reaper invasion. Amidst the Commander’s call for action, the colossal machines make their move, ruthlessly striking Earth and decimating its defenses in minutes. Before long the whole galaxy is in flames as every major civilization comes under attack. Conventional tactics prove useless against such a foe, so the Alliance launches a desperate gambit involving an ancient Prothean device – the Crucible – which could theoretically end all this. Making this crazy plan work will take the combined might and know-how of the entire galaxy, and a lot of old disputes need to be settled before everyone can point their guns, claws, tools, and ships in the right direction. On top of this, the Illusive Man still has his sights on taking control of the Reapers, which means Cerberus is up to their old tricks: assassinations, illicit experiments, sending in the goon squad, etc. Basically, Shepard’s gonna be a bit busy, and this might be just one mission too many for the beleaguered Commander. With Mass Effect 2 as the gameplay template, ME3 doesn’t make any radical changes to the control scheme or the cover-based shooter mechanics. You’re still running from one linear setpiece battle to another, ducking behind ubiquitous chest-high walls and using class-specific powers to clear a path towards quest markers. It’s as arcadey as its predecessor, though the corridors have widened considerably, feeling more organic and allowing for multiple angles of attack. Other hooks are thrown in on occasion, from mounted turrets to scripted battles with specific weapons – such as a targeting laser for an orbital barrage, in one memorable instance – but otherwise this is merely a refinement of the ME2 formula, which is by no means a bad thing. Several aspects have been tweaked or modified for the better, of course. You’re given a much bigger toybox of weapons and a sensible weight system for carrying them, and amazingly they all can be useful with the right mods or tactics. Grenades make a welcome return, and powers have branching upgrade tiers, so even max-level import characters will have new stuff to try. General gameplay has seen more changes, starting with quest structure. Key missions take you to various species’ homeworlds, all under Reaper assault or dealing with some related headache, but you’ll still have time to run around the galaxy and clear sidequests. Some involve dropping planetside for a fight, but many can be solved by just scanning for some widget and carting it back to the Citadel. Scanning now issues a sensor ping that reveals anything interesting around the Normandy, and you’re looking for war resources (or fuel, considering most fuel stations have been destroyed) instead of raw materials. The catch is Reapers will pursue you if they’re in the system and you scan too often, forcing you to flee or face a game over. It’s less time-consuming than getting enough palladium for the facial reconstructor, but it’s still rather tedious. Paragon and Renegade meters are intact, with the addition of an overall Reputation meter. You can always go firmly towards one side or the other, but this time around you don’t have to be as consistently blue or red to keep those options open later. The main number to watch this time is your effective military strength, a numeric tally that sums up how well you’re prepared for the final showdown: your amassed ships, rescued crews, morale boosters, construction of the Crucible, etc. Pretty much every quest, sidequest, and tracked import value ties into it somehow, and it’s a neat idea in theory. Sadly there are problems in execution, starting with the almost-necessity of multiplayer. War readiness is a percentage modifier that starts at 50% and increases based on multiplayer matches. Thus, a total military strength of 7000 is actually 3500 by default, and you need something in the 4-5000 range to get the ‘best’ ending. On top of this, the whole thing matters less than you’d think it should in the end. While you’ll see subtle differences in the cutscenes leading up to the final battle, there are few if any tangible differences on the ground, and its connection to the ending is… well, the ending’s kind of a separate issue, but suffice it to say there’s not much payoff for all your effort. Which isn’t to say it’s not worth doing, or looking at for that matter. 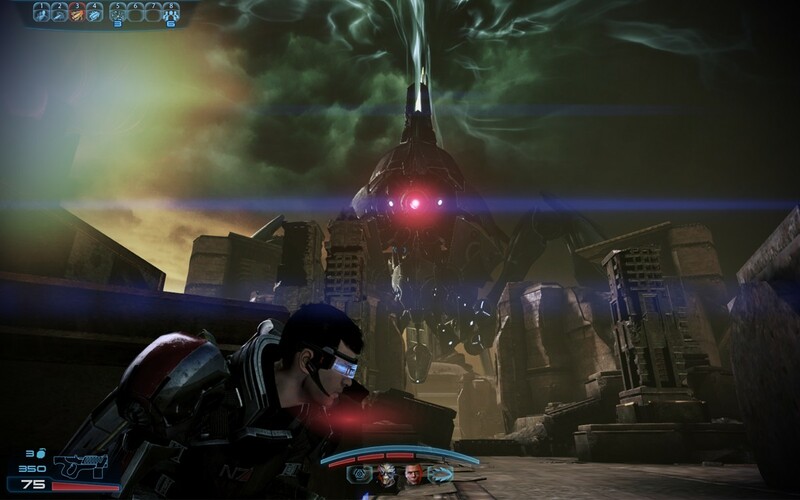 ME3 spends a lot of time amidst expansive backdrops full of impressive-looking destruction. Earth sets the tone in the first few minutes, with Reaper ships effortlessly swatting down scattered defenders and knocking over towering skyscrapers. It’s not all flavor either, as explosions scatter debris into the foreground and airborne monstrosities drop husks and other “converts” into the fight. The moon around Palavan, the turian homeworld, is another early high point, contrasting heavy action in bunkers and trenches with Palaven itself as it burns in the sky. In quieter moments you see the strain of war, with the Citadel burdened by a non-stop influx of refugees, each with their own sad story and picture to go on a wall. It’s all grim and well directed, combining the spectacle of big-budget action games with Mass Effect‘s imaginative sci-fi locales. There are certainly blemishes – texture hiccups, animation glitches, characters that fall squarely in the uncanny valley – but even the most discriminating graphics enthusiast will find something worth stopping and staring at. In the audio department, 3 handily matches and often tops prior games in the series. The soundtrack hits the all right notes, using both signature tracks (including welcome holdovers from Lair of the Shadow Broker) to newer, more melancholy piano chords. Dissonance is employed very effectively, such as one memorable instance where Grunt, aided by a soft, haunting track, demonstrates what a pure Krogan is truly capable of. On that note, one could go on for days about the acting. Listen closely and you’ll find a flat delivery or two, but for the most part characters old and new turn in stellar performances. Shepard is well served by Mark Meer and Jennifer Hale, who both sound more in charge of the role than ever. By the end of the journey, their respective commanders sound thoroughly exhausted, as anyone would be after being tasked with so much. Even stand-ins for potentially dead characters are done well and given plenty of personality, showcasing BioWare’s dedication to content that many players might never notice. People, please, we need to get organized. Quest givers on the left, bantering couples on the right. You could argue that characters are the heart and soul of BioWare games, and Mass Effect‘s motley cast has really grown over the course of the series. Whether shooting the breeze with Shepard or confronting their own demons, you get the sense that these people have developed real histories and relationships. Regrettably, most of your ME2 buddies don’t sign on as squadmates, and the Normandy feels emptier than it should as a consequence. Nonetheless, every one of them, party or no, gets their moment to shine; Jack has matured greatly in the interim, without losing her unique edge. New characters, underdeveloped by comparison, are still excellent additions. James Vega, seemingly a typical leatherneck soldier, has a likably dry sense of humor and is more thoughtful than he lets on. Cortez, your shuttle pilot, is another standout, whether bantering with Vega or coming to grips with his own personal issues, and BioWare exercised a lot of care and restraint in writing him. And yes, should you have opted for a romance at some point, even this late in the game, rest assured that a satisfying conclusion awaits you. There are certainly more nitpicks. You’ll spot cracks in the story here and there, many in the form of Kai Leng. Ostensibly a Cerberus assassin and major antagonist, Leng feels basically plot armored into importance. Cerberus itself seems more of an afterthought, something thrown in so you’re not fighting Reaper forces all the time. The speed of the invasion begs the question of what, exactly, the Reapers were waiting for, and whether your actions post ME1 mattered at all. DLC imports and several major choices are sadly muted in effect, from Shadow Broker to the Rachni Queen to the Collector Base. Diana Allers, a potential recruit who embeds herself as a shipboard reporter, is also a misfire as a character; flatly acted, hideously dressed (yes, even by Mass Effect standards), and unnecessary given Mass Effect has two well-established reporters it could have used. And lest we forget, technical problems lurk in the background, from quest update bugs to Shepard getting locked in place when visiting the cockpit. That one was repeatable to the extent that I began compulsively saving before speaking with Joker. As is often the case with Bioware, however, focusing on the minor negatives massively undersells the core experience. Major plot missions are exceedingly well developed, such as the Krogan homeworld of Tuchanka. Your options there depend greatly on who chose to do what and whether they survived, and it’s one case where the game makes smart use of past decisions. This being war, you can expect to lose people if you’re not careful, and sometimes even your best just won’t be enough. The losses don’t get much more personal, and as emotional rollercoasters go, ME3 is one gut-wrenching or fist-pumping climax after another. When Shepard, battered but defiant, Renegade-interrupts a goddamn Reaper, it would take the most jaded of cynics to not get swept up in it. Your crew adds plenty of dramatic punch to the story, from off-the-clock antics, like coaxing Joker onto the dance floor, to more serious and touching moments, such as Liara recording a time capsule should the worst come to pass. Incidental dialogue with background characters is effective bordering on brilliant. You simply have to follow through with Conrad Verner, if only for a veiled apology for his ME1-2 import bug. As for Shepard, the Commander barely gets time to process what happened in one chaotic scenario before scurrying off to the next, and being everyone’s go-to hero is finally taking its toll. 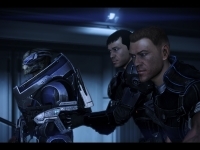 There’s a slight loss of player agency as many of Shepard’s lines require no input and there are fewer neutral responses, but the trade-off is the Commander is much better established as a character. There are hints of a brewing trauma case, played out in brief nightmare segments, and for related reasons your flight from Earth is genuinely startling. 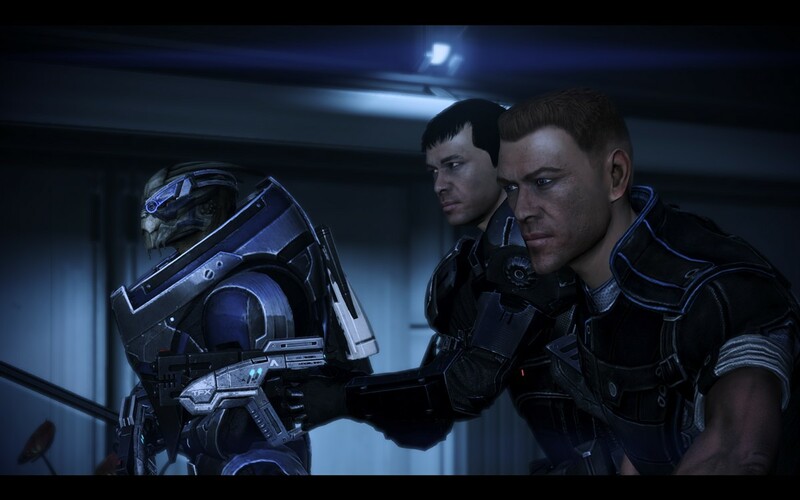 That said, earnest conversations with squadmates are more effective at showing this side of Shepard. With that in mind, the plot builds toward a suitably epic showdown: the Reapers make their stand, Cerberus makes their move, and your combined forces launch their desperate plan. Right to the end it’s a frantic, intense, and foreboding affair, so much that you may successfully ignore nagging questions like “Wait, the Illusive Man was doing what? 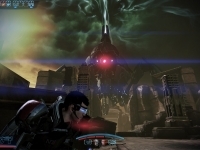 And the Citadel is where, now?” Given Shepard’s mental state and the road to get here, players could be forgiven for expecting something bad to happen. Frankly, “something bad” would still have been something, which is a lot more than what’s waiting for you. What follows ventures deep into spoiler territory, but suffice to say the game makes an unexpected, outright bizarre tonal shift that’s entirely at odds with the rest of the game. The Decisionmotron 4000 rears its ugly head again, this time bolted onto a pulpy space opera that decided at the last minute it wanted to be 2001. ME3 clearly shoots for a game-changing mind screw, yet the closing minutes feel like someone just changed the channel and suddenly we’re face-first with a very literal deus ex machina. It’s not really mysterious or unclear, it’s just terrible in nearly every way something can be terrible; a bad idea, poorly executed, that raises a whole new set of questions in the closing minutes without answering them. As mentioned, your readiness score does affect which endings you have access to, but for wholly arbitrary reasons. The differences between endings, supposedly vast, are represented by little more than scene-for-scene palette swaps. I wish I were exaggerating. I can’t let you do that, Shepard. Believe me, you’ll thank me later. Hence the reviewer’s dilemma. Mass Effect 3 is an excellent game that does almost everything it should for most of its 30-plus-hour running time. Characters all have their moments in the sun, from the newest squadmates to the oldest, most obscure NPCs from years ago. The friendships and relationships your Shepard has built up feel authentic, and when the emotional punches hit, they hit hard. I laughed at Shepard and Garrus knocking an item off the bucket list. I cheered when Mordin made his dramatic entry. I was close to tears – honest-to-goodness tears – when (spoiler redacted) made their heroic sacrifice. Building the fleet feels as epic as it should, and there is a real sense that you are changing the very foundations of galactic society. The music is an utter joy and the acting is outstanding. In spite of technical instability and the occasional plot hole, this is a game that emotionally fires on all cylinders from start to near-finish. As I said, it’s simply not fair to denigrate the whole experience because of a disappointing finale. Yet the end comes not with a whimper or a bang, but a plane missing the runway and trying to land in the parking lot. Yes, the ending matters, and yes, it can bring the rest of the game down. Mass Effect 3‘s ending is a creative failure, an attempt at something big and meaningful without a logical framework to support it. It’s the mother of all commercial misjudgments, the kind that makes scary people in suits say mean things and call for security. I can only speculate as to the motives behind it. 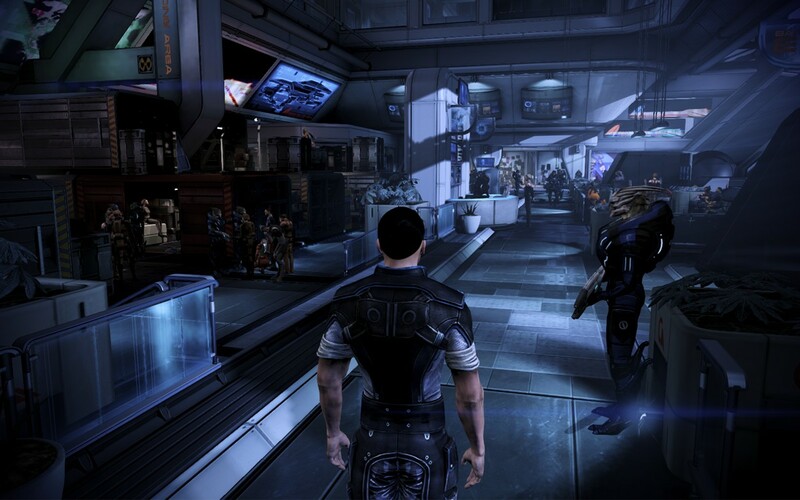 Mass Effect is a successful sci-fi epic that many writers can only wish they could create. Overnight this critically acclaimed series turned into a cautionary tale in game design and marketing, a warning that reads “for the love of god, don’t do this.” As an artistic gamble it’s a bold one, in the same sense that stripping down in public and setting your hair on fire is technically bold. It’s also extremely dangerous, potentially career-ending, and something you will never, ever live down. This ending doesn’t need clarification, it needs help. I really don’t want to judge this game harshly after all we’ve been through. BioWare has made some of my all-time favorite games, and even through this I still respect their work. I never mistook their games for perfect, but there was perfection in their sweeping adventures and rich universes. I was prepared for any number of conclusions to Mass Effect 3. Whether bittersweet, sad, happy, open-ended, or mysterious, I believed it would be worthy of the epic build-up that preceded it. I was ready for a second playthrough before finishing, perhaps starting again from the first game, and I was ready to dabble with multiplayer for the first time in god knows how long. Or so I thought. When I think about that now, I realize that I no longer care enough to do so, and I’m ready to just walk away without looking back. Maybe you’ll fare better. Maybe you’ll see genius where I didn’t. By all means, play it and decide for yourself. Just don’t say you weren’t warned. Mass Effect 3 is a banquet of gameplay and storytelling excellence, and yet its ending left me feeling empty. That simply should not have happened. This game was played to completion with a digital download copy purchased through Origin.